Super Bowl = MANLY and I picked a doozer of a manly chili recipe! Meat, meat and more meat get this: Beef Short Rib Meat, Italian Sausage AND Chorizo and AS IF that wasn’t enough there’s also booze, booze and more booze: Guinness, red wine AND bourbon! Combine that with some classic spices and you’ve got yourself a winner. Just because I hate football doesn’t mean I can’t participate. Once it has been brought to a boil and everything has been stirred well, place lid on pot and transfer to a 325 degree oven. Bake for 1 1/2 hours. Remove from oven, skim off fat. Pour over chili, place back in oven and cook an additional 30-45 minutes. Manly yes, but I like it too! Mary that line came to my mind immediately, so appropriate for your manly chili, don’t you think. Where did that line come from anyway?? My age is really showing now! This is a great looking chili, bold and robust flavors. As always, your display is superb! OOOOOOH! That sounds substantial! Good for a cold snowy night’s supper with some fresh baked bread. Love the bowl! Wow, that sounds like a serious chili! My goodness this is boozy! Great picture! This sounds like a perfect combination of ingredients. 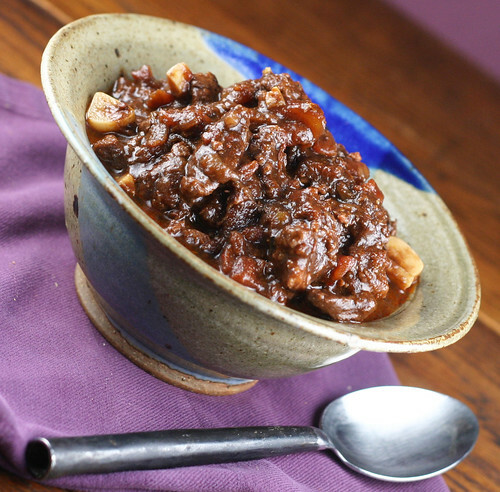 A fabulous chili with short rib meat & the sausages! So perfectly delicious! 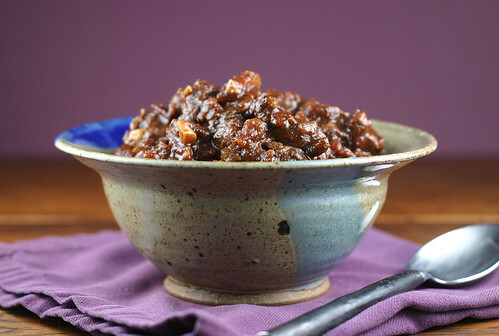 Never thought to add chorizo to chili – brilliant! It looks delicious – thanks for sharing! Chile “Con Carne” to the 10th power! Manly indeed, and one my man would love to see appear on the table. Question: In your ingredients list you have “chipotle sauce”. Do you mean pureed chipotles in adobo sauce? Thanks Debi ~ Either will work – if you use the chipotles in adobo be sure to dice them up. I’m able to get cans of just the sauce part which I like a little better because it’s less messy, but the heat is still there. Oh mary, that looks absolutely DELISH! I’m going to have to make it for the fussy boyfriend! Oh yummy. Look at that. There are so many amazing flavors on dish and so many layers to taste while eating it. This is just gorgeous and scrumptious!! Shut up! This is the most outrageous chili I have ever seen and it has my 2 favorite food groups-meat and booze. Lady, I like your style! Any kind will do Jenni – it all gets cooked down into deliciousness – I used some random Burgundy – Enjoy! That is one nice looking bowl of chili! Can I do this in a slow cooker instead of the oven? I would think that part of the recipe would work in the slow cooker, as long as the first part of the recipe is done on the stove top. Sounds incredible. Can you tell me what Wondra Flour is? I’ve never heard of it – is that just a brand name?